Koh Samui is Thailand’s third largest island at 247 square kilometers, and during the last decade it has become one of Southeast Asia’s premier tourist destinations. Koh Samui sits snugly in the Gulf of Thailand, surrounded by other island gems like Koh Phangan and Koh Tao, and is located 84 km. east of Suratthani, the provincial capital on the mainland. With soft-sand beaches shaded by towering palms, delicious fresh seafood and a vibrant nightlife, Samui has a magical formula that seems to cast its spell on everyone. Many visitors are content to laze the days away on the beach, soaking up the sun and cooling off in the turquoise waters, but for action enthusiasts there are plenty of choices. Diving and snorkeling, windsurfing and paragliding, beach volleyball and off-road driving and a lot more. One of the island’s most appealing features is its loop road, which makes a 50 km. circuit around the island, giving tantalizing glimpses of superb beaches on the north, east and west coasts. It runs past sleepy fishing villages and through seas of coconut palms, passing Samui’s most impressive waterfall and tempting turn-offs into the highlands along the way. Other attractions on or near the road include a butterfly farm, a snake show, a monkey-training center, and health spas dedicated to pampering the body. 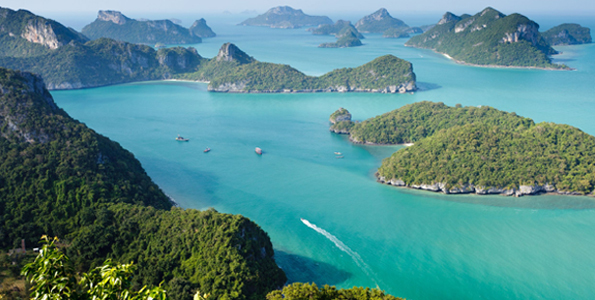 There’s plenty on Samui to keep even the most jaded traveler happy for a week or two, but for anyone spending even a few days here, an opportunity not to be missed is a trip to the emerald islands of the Ang Thong Marine National Park, which offers yet another version of a tropical paradise.